Walmart Inc. sailed into the holiday season with stronger-than-expected sales and a boosted full-year outlook, signaling that the world’s largest retailer can more than hold its own against rival Amazon.com Inc. in the critical holiday weeks ahead. Comparable sales for Walmart stores in the U.S. -- a key performance barometer -- rose 3.4 per cent in the third quarter, beating analysts’ estimates. The retailer received its biggest boost ever from its online unit, which has attracted more customers thanks to a website redesign, more delivery options and new products from Nike and other top brands. That’s helped put distance between itself and retailers like J.C. Penney Co., whose sales missed expectations Thursday. Walmart is poised to be a big winner in what is shaping up to be the best Christmas shopping season in recent memory. Walmart’s wide variety of products -- from toys to turkeys -- and low prices both in stores and online have positioned it to grab new sales as retailers like Toys “R” Us Inc. have faded from the scene. Walmart’s position as the nation’s top grocer has also provided a bulwark against Amazon, which is still figuring out its food strategy more than a year after acquiring Whole Foods Market. “Walmart will be one of the pace-setters this holiday season,” Moody’s Corp. analyst Charlie O’Shea said in a note. Walmart shares rose as much as 2 per cent before the start of regular trading in New York, before paring gains. The stock had climbed 2.8 per cent this year through Wednesday’s close, beating the 1 per cent gain in the S&P 500 Index. As its food business goes, so goes Walmart. And it’s been going well lately thanks to price cuts, refurbished produce displays and a rapid rollout of curbside grocery pickup, now available at nearly 2,100 stores. Shoppers like the convenience, and the service has attracted new customers as well as higher average orders. “Walmart has been exceptional at quickly adapting to the realities of modern retailing,” Neil Saunders, an analyst at GlobalData Retail, said in a note. Web sales came in ahead of Walmart’s full-year forecast, growing 43 per cent in the U.S. The redesign of a once-clunky site has boosted traffic and Walmart has grown its market share in every major online category, according to GlobalData Retail. Those sales come at a cost to profitability, though, as online orders are more expensive to fulfill. Gross profit margins narrowed once again in the quarter, also weighed down by high transportation costs. 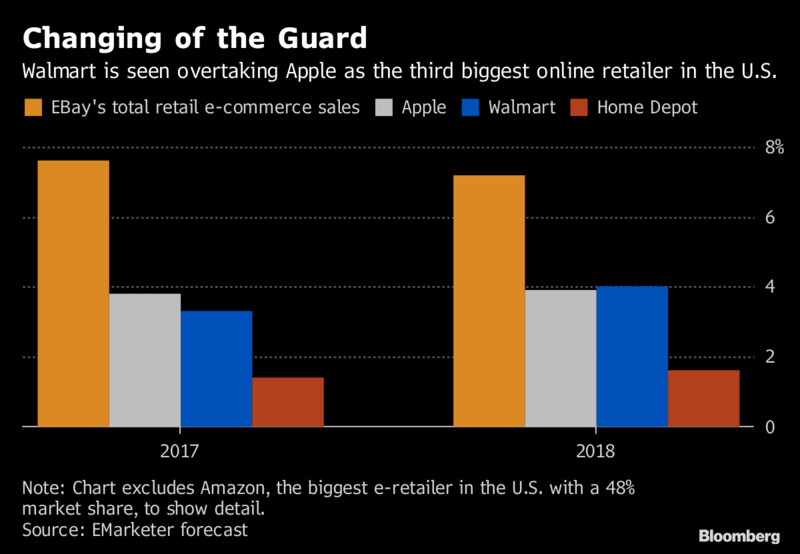 Looking ahead, Walmart also needs to avoid the supply-chain snafus that its website suffered during last year’s holiday season, which hampered online growth and worried investors. “There is more work to do here in making Walmart.com the first port of call for shoppers who are very used to defaulting to Amazon,” analyst Saunders said.